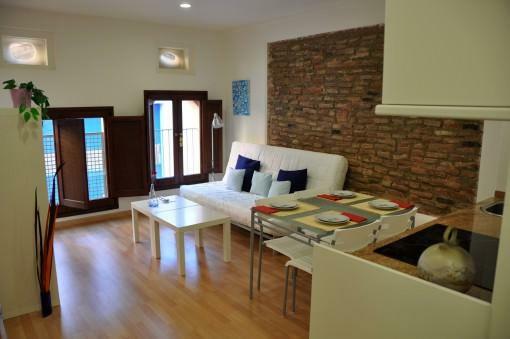 If you come to Barcelona with friends, daily rental apartments are a very good option to stay. You able to have a good time together and also apartments equipped with kitchen allow you to prepare something to eat and save on some meals to make your trip more affordable. That is why we believe that daily rental apartments Barcelona City Apartment can be a very good choice if you want to stay in apartments in Barcelona. It is a low cost option close to Torre Agbar and Glories, not far from the city center (less than half an hour walk and a few minutes by subway). In addition, with excellent transport communication and very close to the famous nightclub Razzmatazz and Marina Zone, lest the party do not stop all night;-). Walk a few streets and breathe the air of the Mediterranean on the beaches of Barcelona; go shopping at modern shopping center in the city (Diagonal Mar) just minutes from your apartment; take the metro four stops, and will be in Las Ramblas to experience the bustle of the center; leave your apartment for a walk by the Sagrada Familia or Parc de la Ciutadella. If yours is not a leisure trip, but come on business, well you are in luck. These apartments you can rent per days will allow you to sleep in the most thriving business district of Barcelona, 22 @, with large companies located in the city. Walk a few minutes to attend a conference in the International Convention Centre of Barcelona (CCIB), one of the largest in Europe and one of the landmarks of the new Barcelona (Forum building). Take the subway to attend a trade fair at the Montjuïc (Plaça Espanya) in 10 minutes. Moreover, all these amenities in Barcelona in a perfectly equipped apartments with kitchen that includes daily maid service and you can rent with no minimum days. Apartments that offer you live like the locals.